Share some local files to test this theory. acraigbray wrote: I am having the same issue as reported by Eric and mhendu. I have exposed my MediaMonkey server's devicedescription.xml by opening a hole in my firewall and mapping the port to one that is forwarded by my router. I am able to browse to devicedescription.xml from outside of my home network and this works just fine. I am also able to then open MediaMonkey from a remote location, add this server and receive a successful notification that "New media server has been added". The server will then appear in the MediaMonkey client but when I attempt to expand the node I find that there is nothing to expand and that I cannot receive any content from the Server. Anyone have any suggestions for this? I am having the exact same issue. DId you ever get this resolved? I set up server OK from MM at home, opened port on router, added a media server from MM client from my work PC. It does connect but shows no content. Same as your problem and I realize your post is old but just wondering? In response to gguerra, I never got this working. I've tested this behavior with every subsequent released version of MM and haven't seen any differences from what was originally reported. If anyone has actually got this working I'd appreciate any suggestions on how to improve the configuration but it certainly seems like a bug. I want to bump this as it is a feature I was really looking forward to using but haven't seen any further development. The second one shows a workaround to just use a different app to access your media server. This does work (and seems to work in a variety of different UPnP apps), but is not a real solution since I want to utilize the features of the MediaMonkey for Android app. No attempts to fake MMA into thinking you're on the network when you are not legitimately connected via Wi-Fi are successful. 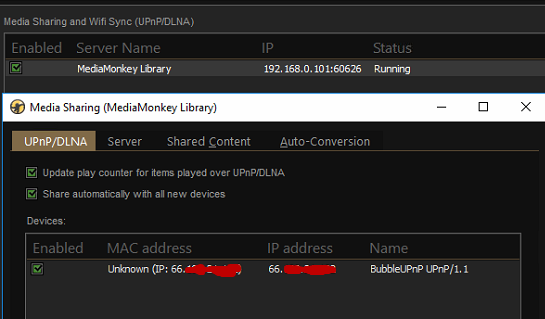 I've been using bubbleupnp on my android to stream my mediamonkey library over the internet. There's a windows phone app too, and I believe you can use foobar2000 to stream to a windows PC. I would love to be able to do this from the Android app. For now, I'm trying to use BubbleUPnP to access my MM library remotely. I feel like I'm partway there, but it's not quite working. When I try to connect from BubbleUPnP, it says "The remote server could be joined but returned HTTP error code 404." Looks like it can tell my device is trying to connect. My router's port forwarding looks good I think. Edit: I've also tried http://<my_ip>:74/DeviceDescription.xml. Same result. Is anyone successfully streaming to an app on their iPhone? I would love to be able to listen to my home library of 250 gig of mp3's and FLAC over my iPhone. Has this function come to MM for Android? No, MMA can only do in-network streaming. I also suggest to move port outside 10000 or even forward same port. Lowlander wrote: No, MMA can only do in-network streaming. Guess I'm stuck with syncing while at home for on the road. When this happens and I can listen to my 4 TB Server at home from my Galaxy phone, my life will be complete. Oh, and also need to be able to stream different songs at once to my (soon coming) Sonos system.